Suitable for middle-scale or large-scale production.Designing yearly output is 10000-100000Ton. Provding different equipment configuration according to different production requirements.Each system is optional. Include manual ton bag strength transport system, measure strength transport system. 3.Thinning reactor: It’s a jacketed stainless steel high shear reactor, with low speed mixer and high shearing machine on it. Normally the mixer speed is 35rpm, shearing speed is 0~2900rpm. 4.Mixing kettle: It’s a single layer stainless steel kettle, with low speed mixer on it. Normally mixing speed is 85rpm. 5.Filter: bag filter, stainless steel material. 6.Automatic filling line: Including automatic-pushing system, measure filling unit, automatic nipping system, stacking system. 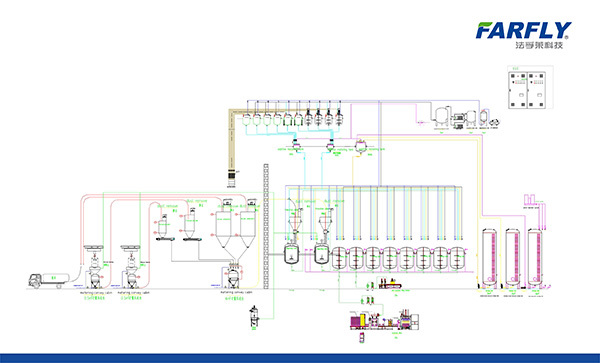 1.Material measure system(material tank,feeding engine,weighing unit,dust removing system, detecting system).